As soon as your little one becomes mobile, you quickly learn all of the places in your home you don't want him to go. 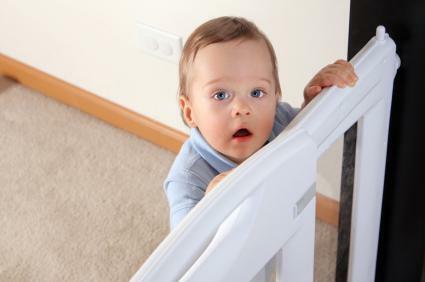 Whether you need to keep him from falling down the stairs or just want to keep him from creating a new system of organization in your office area, a baby gate will do the trick. However, you must do your research to determine which type of gate will best fit your home's safety needs. Pressure-mounted gates work best for doorways, hallways and as temporary gates. They are also an ideal option when you have woodwork or walls you do not want to damage by screwing in a hardware-mounted gate. While sturdy, a pressure-mounted gate should never be used at the top of stairs. Less expensive pressure-mounted gates require you to slide open or remove the gate whenefver you want to go around it. Gates that are more expensive stay in place and feature a door within the gate for you to walk through. Try one of these pressure-mounted gates in your home. Good Housekeeping's top choice for a doorway gate is Evenflo Soft N Wide Gate. It is made of nylon rather than wood, plastic or metal. Its long size makes it an ideal portable gate as well because it can fit most doorways and odd angles. The Safety 1st Wide Doorways Fabric Gate is a similar gate which also earns high ratings on Amazon.com. For an attractive pressure-mounted gate, try the Dream Baby Auto-Close Security Gate in black or white. It receives a four-star rating from Babies 'R Us customers. Made of 100% recycled materials, the Safety 1st Nature Next Gate is an inexpensive, attractive pressure-mounted gate that received four out of five stars on Amazon. The First Years Hands Free Gate opens using a foot pedal so you do not have to struggle with opening the gate while you have your hands full. It also has a four-and-a-half-star rating on Amazon. Regalo Easy Step Walk Thru Gate features a doorway within the gate and comes with extenders to make it fit well in all sizes of doorways and hallways. It does have a bar on the floor that could be tripped over if not careful, but is still rated highly on Amazon. North States Supergate Ergo Safety Gate can be used as a portable pressure-mounted gate, but it also comes with multiple hardware-mounting options to make it even more secure. While it has high reviews on Amazon, it is best used as a gate for areas you do not access often, as it difficult to open and close. With close to a five-star rating on Amazon, the Summer Infant Extra Tall Decorative Walk-Thru Gate is an attractive and safe hardware-mounted option. Because it contains a door within a gate, it does make the doorway or hallway narrower if you often walk through with wide loads. While nearly all hardware-mounted gates will work at the top of stairs, a few have been designed specifically with stairs in mind. If your home cannot accommodate a hardware-mounted gate the top of the stairs due to a lack of space or studs, place a hardware-mounted gate in a hallway near the stairs or doorway to keep your baby away from the general vicinity of the stairs. Cardinal Gates Stairway Special Baby Gate has a four and a half-star rating by Babies 'R Us customers for its height and ability to open in only one direction. It may be difficult for adults to open with their non-dominant hand. Evenflo Top of Stair Plus Gate receives high marks on Amazon.com and features a one-hand release system. Although the Consumer Product Safety Commission recalled the gate, newer models have addressed the problem. Look for models 10503 or 10513 and avoid models 10502 and 10512. Kidco Safeway Gate is rated four out of five stars on Amazon.com and can be easily installed on banisters without damaging them. You may also want to purchase the Kidco Stairway Gate Installation Kit which can be used with any Kidco gate or hardware mounted gate you want to install at the top of stairs without drilling into a banister. Most baby gates are designed to extend to 48 inches, but many of the places you want a baby gate may be wider than that. For those extra-wide hallways or areas between rooms you want to block off, you need an extra-wide baby gate. 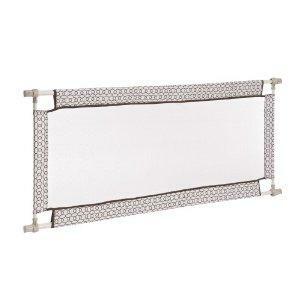 Look for hardware-mounted baby gates that allow you to purchase extenders to add to their width or find a baby gate that already comes with the extra-width built in. For super wide openings, there are very few gate options, so while the Summer Infant Custom Fit Gate receives four out of five stars on Amazon, it is a viable option for spaces up to 12-feet wide. If installed properly, it does the job of keeping baby out of unwanted spaces and can be configured in multiple ways to fit unique spaces. The Kidco Auto Close Configure Gate does not require walls to line up in order to be used. It can be angled to fit unique and wide spaces and has four stars on Amazon for its ease of use and attractiveness. While some safety experts recommend avoiding gates with diamond-shaped openings, the Munchkin Wide Spaces Expanding Gate is ideal for spaces up to 65 inches wide, especially when you do not always want the space blocked off. The expanding diamonds are designed to prevent children from getting pinched or strangled. Regalo's Extra-Wide Widespan Gate is an easy to install pressure-mounted gate that can be attached to multiple extensions to make it fit extremely wide spaces. Munchkin's Easy-Close Extra Tall and Wide Metal Gate has a four-and-a-half-star rating on Amazon and is designed to accommodate up to three extensions to fit spaces up to 51 inches wide. It features an easy open-and-close doorway and is attractive. Never put a gate more than two-inches off the floor, otherwise a child could try to crawl underneath. Make sure a gate is at least three-fourths of your child's height. Choose a gate that locks securely and cannot be opened by children. Avoid gates with horizontal bars or that your child can climb. Gates with slats more than three-inches apart pose a strangulation risk and should be avoided. Measure before you go to the store to make sure you get a baby gate that will fit the space. Your baby's safety comes first. 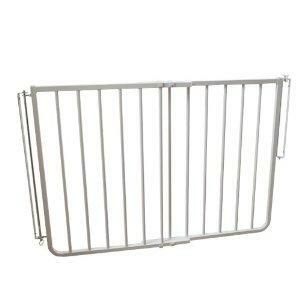 Do not choose a baby gate solely based on how it looks or how cheap it is. Sometimes it is worth compromising your home decor or spending a little bit of money to keep your baby safe. If you have trouble finding and installing a baby gate, do not hesitate to call in a professional to help. It is better to spend a little extra money to keep your little one safe rather than face an accident because you didn't know what you were doing.